If you are on Lester Cavanagh's mailing list you may have already seen this but it's a fun article about using betting systems and I'm happy that Lester has let me publish it here. Before I hand you over to Lester a quick update. I got off to a losing start with Classic Racing yesterday but had an excellent day with Mark Foley's Trainer Trends. No, actually I don't think it is. Every time I come up with one my heart skips a beat and I get butterfly's in my stomach. If I don't use one for a while I miss it. Systems even keep me warm at night (expensive duvet) and don't complain if I leave the toilet seat up! Sometimes me and the system are getting along fine and then we fall out over the 4.15 at Newcastle. We almost always make up, usually after the next winner and all is forgiven. I love systems for a number of reasons. I like the intense research months where I think about nothing else. I get lost in a world of videos, facts figures and trends and then that amazing Eureka moment when everything falls into place and you know it will work. I'm not alone in my love for systems but for every system fan there will be two haters somewhere. You must have heard it before. Some will swear that systems don't work and they would be half right. Some systems dont work usually because they don't have the key ingredient present, an angle. They will usually mention the dreaded word backfitting. Backfitting is a dirty word in our industry. Backfitting is the manipulation of data to produce results that wouldn't stand up to real life betting. I agree to some extent but I had this argument with a pro gambler once who read form to find the value necessary to make a long term profit. He said he didn't use systems because of the backfitting issue. I said the definition of a betting system is the use of past data to help us find future winners. He agreed. I asked him how he came to find his bets. He wouldn't tell me the whole story but he reeled off a number of things he looked for before making a bet.Most of it was stat based. Betting systems can be based on anything but the best ones are the simple ones based on a strong angle. One system that did the rounds years ago (name escapes me) was based on an angle but didn't have a strong and logical reason. The system seller didn't reveal the angle and just sold the selections which is fine and at first the selections did quite well until the system rules were unveiled by a bitter friend. The one and only rule of the system was to bet on any horse who's jockey was wearing pink colours! Needless to say the system didn't work long term. When I personally design a system the angle has got to come first. To get the ideas I read as much as I can and watch as much as I can. The inspiration may come from an article or a result or even something a presenter has said (usually not the channel 4 lot). The keys to using a system once one has been found are confidence and patience which generally go hand in hand but the single most important thing to develop when betting in general is discipline. To be disciplined you need to be able to cope with what I call the itch. The itch is always there for some, including me. Gambling can be like an itch you can't scratch and when you do it moves to somewhere else, ahhh annoying!! The itch tells us to gamble when we shouldn't and there is money to be made everyday on a multitude of different sports. It is what makes us bet on the Mongolian goat hurding at 1.30 in the morning. Yes we may have spent hours on Hurdingstats.com which convinces us to make the bet when we know we really shouldn't. Betting systems help me control the itch and systems themselves can help you on the way to a disciplined mind set. These days I am just as proud of myself for avoiding a bad bet as I am when I win a good one. Apart from the big meetings I hardly ever try and read form at all, and it's still a system as explained earlier. My systems tell me when to bet based on years of stats, and just as importantly when not to bet! For example football. It is my first sporting love and the sport I feel I have most knowledge about. Can I win at it?…..Not a bean so I have stopped. I suppose that is a system in itself. The don't bet on football system has made/saved me thousands. When I am searching for a system to review, follow or recommend I look for the angle first. If it is a sound and logical angle I will explore the system further. Then the results. Any system must have many months if not years of publicly displayed results or at the very least been proofed to me or someone I trust. Then we must decide whether the system will suit our style of betting. Some will have multiple bets a day and other will have less than one a week. We must also look at the stake size we must use to pay for the system/selections and make a nice profit. Credentials of the seller are also important. Is he/she a real person? Has the product been reviewed on a trusted website? Only then can we consider giving the system a trial to small stakes or even better by paper trying trading first. After all that and more we can take the plunge. There is no better feeling when discovering an easy to use system that makes money. I suppose at the end of the day systems can be a cruel mistress at times and even the best can make you fell like leaving them. Once you have found the right one treat her well, respect her and spend time with her and the rewards can be amazing. Choose her at random without paying any attention and leaving the toilet seat up will be the least of your worries……. We also have details of two of John's well handicapped horses running today. 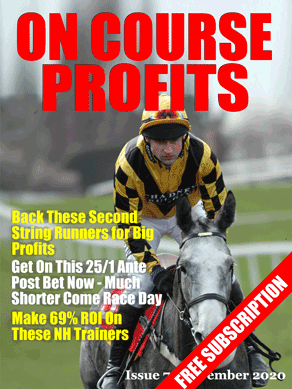 This interview was conducted by Steve Carter of the Betting School Insiders Club. When did you first get interested in horse racing and betting? Whilst living in Hong Kong between 1979/1980. My father and two elder brothers were regular visitors to the two racecourses (Sha Tin and Happy Valley) and I remember being impressed on the couple of occasions that they returned home and emptied some quite large amounts of money onto the dining-room table! My first visit to a racetrack came a few years later when I was nineteen. That was when I came to believe that there was money to be made from betting on horses. Although I lost what little money I had that day, by betting on horses that I liked the look of in the paddock, my brothers had been studying the form and they proceeded to go through the card. The last winner (if memory serves me correctly) was a horse called Taskforce Victory which landed them a six horse accumulator and the Placepot and combined winnings of over £2000. It was soon after that that I began to take a keen interest in the contents of the Sporting Life paper that they regularly bought and to start listening to what they had to say about form analysis! Did your betting activities bring instant success or did it take a while to learn the ropes? There was certainly no instant success. It took years before I began to show regular profits. Both myself and my brothers spent years trying to develop those illusive winning systems but most of them were unceremoniously binned after the first inevitable losing run. I had a few decent successes with Lucky 15 bets which helped to recoup some of my losses but overall, although I didn’t keep records of every bet, I was certainly in deficit to the bookies. The great majority of punters will spend years losing money whilst learning the trade and the great majority will continue to lose money because they can’t or don’t want to learn from their experience! Were there any early influences that shaped your approach to successful betting? Yes, without a doubt the biggest influence was Nick Mordin’s ground breaking book Betting for a Living. Nick’s work was outstanding, primarily because it was such a huge step up on previous British racing literature. It was this book that showed me how to work out my own draw statistics and also introduced me to pace analysis. More importantly, it also helped me to discover that there were numerous excellent American books waiting to be read and works by authors such as Andy Beyer, Tom Ainslie, William Quirin and Tom Brohammer completely transformed my understanding of form. How would you best sum up your own style of betting? Periodic and selective. I don’t bet professionally and I am still in the same full-time occupation that I joined twenty-five years ago. For me, betting has been, and always will be, a hobby that I aim to make a few thousand pounds out of each year, whether that be by writing books or by betting. Because of my job (which involves shift work) I don’t have the time or the energy to commit to the necessary amount of form study over long periods of time. I tend to give it maximum effort from April through to July, betting exclusively on the Flat and then I will have just an occasional dabble during the rest of the year. I also bet selectively. I identify horses that I believe to be well-handicapped (and therefore probable future winners) and I keep a list of them to follow. Most of them are lightly raced three-year-olds which I look to back in the first half of the season (whilst they remain well-handicapped). Most of my analysis is done when looking at the results pages published in the Weekender every Wednesday. I scour the results looking for horses that have run well despite being disadvantaged by the various biases that are present to varying degrees in each and every race. I am also looking out for horses that have clocked fast times. For a fuller explanation of the methodology, readers will have to buy my latest book! I used to subscribe to the weekly publication Raceform Update and I particularly enjoyed reading the letters and systems submitted by readers to the Sports Forum page. About sixteen years ago I began sending in my own letters. They seemed to be well received in the main and because I was making good profits at the time from the methodology I was using I decided to take it a step further and write a book. I sent in a couple of chapters to Raceform with an explanation of what would be in the remainder of the book and to my surprise they said ‘yes’! How was your own P&L affected by the disclosure of the methods described in the book? It is difficult to know. The method I used then was built around my knowledge of draw bias, which for a good few years gave me a significant edge over the majority of other punters. That began to diminish as more and more people became aware of the power of the draw and the odds about the well-drawn runners started to tumble. Perhaps my book contributed to that to some extent, but I think that Graham Wheldon’s books about the draw, which were published around that time, were more influential in changing people’s perceptions. More generally, I would say that it is a truism that winning methods normally have a limited lifetime because inevitably other people will catch on to them and they eventually become over bet as a consequence. The game keeps slowly changing and you have to keep adapting your methods in an attempt to stay one step ahead of other punters. There is of course no guarantee that you can keep successfully doing that and that is why I have always been reluctant to risk packing up the day job in favour of full-time punting. In your opinion where does the average every day punter go wrong given that the statistics generally quote that 98% make a loss? They bet in too many races and on the wrong type of horse. Most people would improve their chance of success if they became a lot more selective and put more money on fewer bets. Another truism in my view is that you cannot construct good bets every time you open the Racing Post, but instead you have to wait for them to come along. I am reminded of this most years during Royal Ascot week and the Cheltenham Festival. I meet up with one of my brothers and we treat the weeks as a bit of fun and try to find the winner of every race. More often than not we fail dismally! In part two tomorrow John talks about his current methods for finding winners. Related to five winners and cost 160,000gns as a yearling. He was a relatively late foal (April 8) and will make a better 3yo once he matures and based on his 2yo form he gave the impression that he might make into Listed class. This season he won a class 4 3yo handicap at Bath in early August and finished down the field next time out in the very hot class 2 Melrose Stakes at York. Last time out having been close up he weakened out of it on his first run on firm going and has been dropped a couple of pounds in the handicap. The forecast going today is good to soft and he drops back to a trip more in line with his two wins to date which were over 9f and 10f. Has proven form in the conditions and the ease in class may be able to bring out a return to form for this lightly raced colt should he take his chance. Related to no less than 12 winners including the 118 rated Almutawake so she has a lot to live up to. Being by Medician she is probably going to be suited by a sound surface. She won on her final start as a 2yo in a maiden at Catterick over 7f and did well from a poor draw. Hopefully she will get better with age and a rating of 73 looks manageable. So far this season two runs have not shown much and she now runs off a mark of 69. Interestingly she is upped in trip to 11f for the first time having not into either of her starts over 7f and 8f as a 3yo and the trainer certainly knows the time of day when it comes to trip. This is her easiest assignment and given she stays then may have a lively chance.